Oakbrook is an area of north Lakewood near the Oakbrook Golf and Country Club. With a population of 13,000+, it is a densely populated residential area along scenic Chambers Creek and features single family homes as well as condos for sale. Oakbrook is surrounded by some of the state's finest parks, natural areas, and golf courses; Fort Steilacoom Park, the city's largest park, is 340 acres of playgrounds, off-leash dog area, lake, and athletic fields. 4 Beds | 3 Baths | 3287 sq. Ft.
Blue Summit Realty has the most accurate and up to date Oakbrook real estate listings on the web. 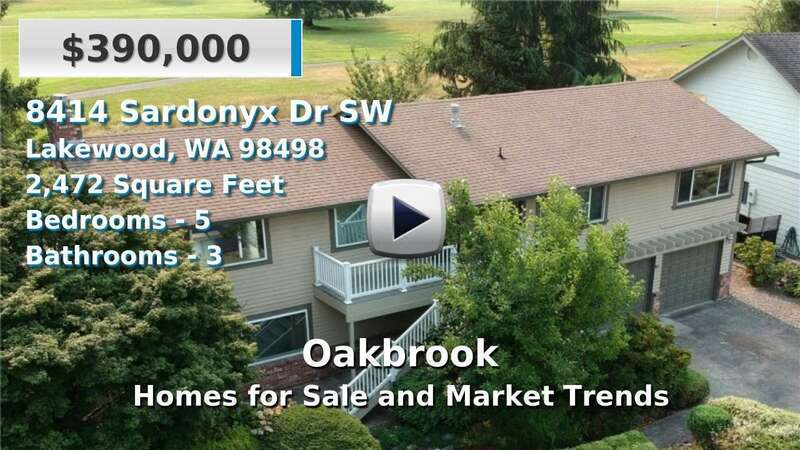 Currently there are 8 homes for sale, 3 condos for sale, in Oakbrook. Of the 11 total Oakbrook residential listings for sale 0 are bank owned, 0 are short sales, 0 are new construction, and 0 are townhomes. The price ranges from $184,950 to $0 with a median list price of $421,356 and median sold price of $323,594. Make sure to refine your Oakbrook real estate search by property type, price, square footage, bedrooms, bathrooms and more with the search tool above or view the Oakbrook listings on our interactive map. Our Oakbrook real estate listings were updated 7 minutes ago.